US-based global news outlet Time – which has more than one million followers on Google+ – hosted its first public video hangout the yesterday. The online video conversation, which used the Google+ On Air feature offering a live, public broadcast instead of a hangout with limited users, was hosted by Jose Antonio Vargas, the writer of this week's cover story of the magazine "We are Americans – just not legally". Last year the Pulitzer Prize-winning Filipino journalist "came out" as an "undocumented immigrant" in an article in the New York Times. In the Time feature Vargas, a former editor of the Huffington Post, describes his year as a public figure without legal status and argues that he is an American. 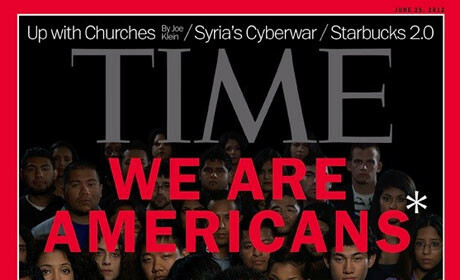 Time used its strong social media presence - which includes more than 3.6 million Twitter followers - and the hashtags #askTIME and #WeAreAmericans to invite readers to ask questions of Vargas and other "undocumented immigrants" taking part in the hangout. Time.com also embedded and streamed the conversation. News sites including the New York Times, which has been experimenting in using hangouts hosted by its opinion department, have also been using the social network to engage with the Plus community. Time has more than one million followers on Google+, putting it slightly ahead of the Financial Times which reached the milestone at the weekend. Time has a combined social media audience of over 5.4 million people across 10 different platforms, including Google+, Twitter, Facebook, Foursquare, Tumblr, Pinterest, Instagram, YouTube and Stamped, the outlet told Journalism.co.uk. It is the "number three news brand on Twitter" with over 3.6 million followers, it has 538,000 fans on its Facebook page and an impressive 35,000 followers on Foursquare. Time has an exclusive partnership with Foursquare for the summer political conventions. It has also been using Foursquare to share updates from reporters on the road. What makes social audiences click and read your article? When social media audiences are not interested in facts, how can journalists report the truth?